This amazing 45 minute saga, told in 18 sections, is the story of a young colt named “Yellowhand” and re-counts “The Battle of the Little Bighorn” as seen through the horses eyes. This wonderful saga continues J.D.’s legacy as one of the recording industry’s greatest story tellers of all time. Some of J.D.’s favorite players were asked to record with him on “Yellowhand” and they all accepted the invitation. Click the PLAY arrow to preview these J.D. Blackfoot tracks! 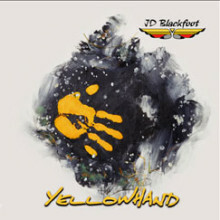 Yellowhand Muscians: Corky Laing – (Mountain) Drums John David Call – (Pure Prairie League) Pedal Steel John Durzo – (J.D. Blackfoot, Uncle Billy, Strongbow, Money) Fender Bass (John Durzo also co-wrote “ Flushed You From The Toilets of My Heart” with J D in 1972 ) A collector’s edition of “Yellowhand”, autographed by the four main players, was sold pre-release to the members of the “Friends of J.D. Blackfoot Music” fan club, and were sold out.